An astonishing bird day February 10, 2010, began when I went with Doug James to Holla Bend NWR for the release of Iowa-reared Trumpeter Swans. Karen Rowe of Arkansas Game & Fish has been working with Iowa Department of Natural Resources to move Trumpeters to Arkansas. This is part of a daring experiment called reverse migration imprinting. The idea is that young swans will use their instincts to return north for nesting and later, return south for the non-breeding season. The ground was snow covered in Fayetteville when we left and snow covered at Holla Bend two hours later. I had my binoculars, but yikes (!) forgot my coat. Doug loaned me a light blanket, which I stuffed indecorously under my fuzzy shirt. When we got near the Arkansas River to the release site, Karen was rounding up folks to carry swans from cages to water’s edge. I was soon honored by a close encounter with Trumpeters -- 25-30 pounds of swan & it’s pleasantly warm down, in my arms. You first must hold their feet tightly – web feet the size of my hands. You firmly hug ‘em to keep that 8-foot wing span closed. Then there is the famous trumpet, a very, very long neck, with an anxious, intelligent dark-eyed creature winding it around your neck, over your head, serpent-like, watching all, honking and hissing, way, way ready for release. Even standing in the snow and coatless, I was quite warm and fully employed hanging on to my swan! When Doug and I worked on the book Arkansas Birds in 1986, there had been no certain Trumpeter records for the state since the early 1900s. 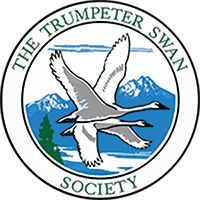 Due to efforts by folks like Karen, Iowa DNR, and others, Trumpeters are coming back. For example, the flock now wintering each year at Magness Lake is a frequent topic of interest among birders in Arkansas. In tough times with lots of bad news, it is easy to feel, as Mark Twain put it, that we are just “the damned human race.” Yet, 16 Trumpeters found their freedom in Arkansas yesterday. Maybe this is not a banner line for Fox News, but it fairly reflects our hopes and aspirations. We are willing to put our amazing brains to work to put right what, in the case of loss of our wintering Trumpeters, had in past years unintentionally gone wrong.